Deer, ruminant mammal of the family Cervidae, are found in most parts of the world except Australia. Antlers, solid bony outgrowths of the skull, develop in the males of most species and are shed and renewed annually. They are at first covered by "velvet," a soft, hairy skin permeated by blood vessels. The stem of the antler is called the beam, and the branches are the tines. Antlers are used as weapons during breeding season combats between bucks. In deer that lack antlers (the musk deer and Chinese river deer), long upper canines serve as weapons. Deer are polygamous. They eat a variety of herbaceous plants, lichens, mosses, and tree leaves and bark. Many species of deer are threatened with extinction. The white-tailed deer that live in woodlands throughout the United States and in Central America and South America was a source of food, buckskin, and other necessities for Native Americans and white settlers. Slaughter through the years nearly exterminated the whitetail, but it is now restored in large numbers in the Eastern United States, and to a lesser extent in the West. In summer its upper parts are reddish brown; in winter grayish. The mule deer exists in reduced numbers from the Plains region westward, and the closely related black-tailed deer is a Pacific coast form. Old World deer include the red deer, closely related to the North American wapiti, the fallow deer, and the axis deer. The only deer in Africa are small numbers of red deer found in the north in a forested area. The barking deer, or muntjac, is a small deer of South Asia. A muntjac discovered in North Myanmar (formerly Burma) in 1997 is believed to be the smallest deer in the world. Called the leaf deer, Muntiacus putaoensis, it stands about 20 inches at the shoulder. The misleadingly named mouse deer, or chevrotain, is not a deer, but belongs to a related family (Tragulidae). Deer are classified in the phylum Chordata, subphylum Vertebrata, class Mammalia, order Artiodactyla, family Cervidae. Deer live in a variety of biomes ranging from tundra to the tropical rainforest. While often associated with forests, many deer are ecotone species that live in transitional areas between forests and thickets (for cover) and prairie and savanna (open space). The majority of large deer species inhabit temperate mixed deciduous forest, mountain mixed coniferous forest, tropical seasonal/dry forest, and savanna habitats around the world. Clearing open areas within forests to some extent may actually benefit deer populations by exposing the understory and allowing the types of grasses, weeds, and herbs to grow that deer like to eat. Additionally, access to adjacent croplands may also benefit deer. However, adequate forest or brush cover must still be provided for populations to grow and thrive. Nearly all cervids are so-called uniparental species: the fawns are cared for by the mother only. A doe generally has one or two fawns at a time (triplets, while not unknown, are uncommon). The gestation period is anywhere up to ten months for the European Roe Deer. Most fawns are born with their fur covered with white spots, though in many species they lose these spots by the end of their first winter. In the first twenty minutes of a fawn's life, the fawn begins to take its first steps. Its mother licks it clean until it is almost free of scent, so predators will not find it. Its mother leaves often, and the fawn does not like to be left behind. Sometimes its mother must gently push it down with her foot. The fawn stays hidden in the grass for one week until it is strong enough to walk with its mother. The fawn and its mother stay together for about one year. A male usually never sees his mother again, but females sometimes come back with their own fawns and form small herds. Deer are selective feeders. They are usually browsers, and primarily feed on leaves. They have small, unspecialized stomachs by ruminant standards, and high nutrition requirements. Rather than attempt to digest vast quantities of low-grade, fibrous food as, for example, sheep and cattle do, deer select easily digestible shoots, young leaves, fresh grasses, soft twigs, fruit, fungi, and lichens. 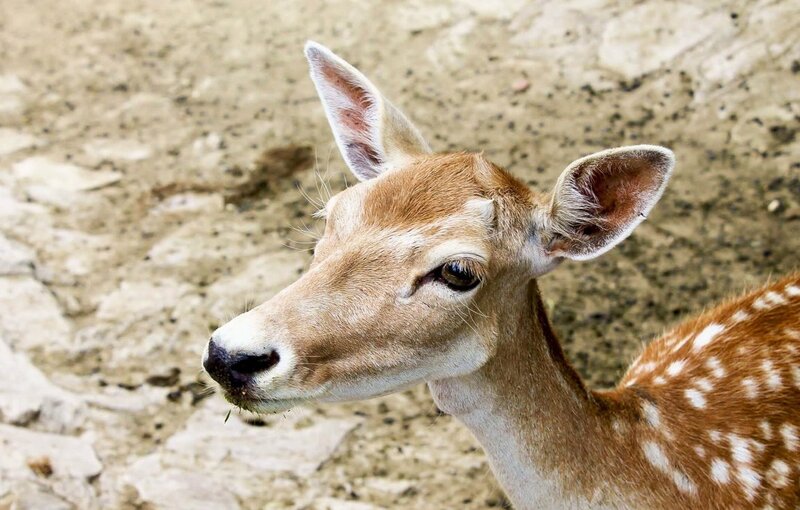 With the exception of the musk deer and Chinese river deer, which have tusks, all male deer have antlers. Sometimes a female will have a small stub. The only female deer with antlers are Reindeer (Caribou). Antlers grow as highly vascular spongy tissue covered in a skin called velvet. Before the beginning of a species' mating season, the antlers calcify under the velvet and become hard bone. The velvet is then rubbed off leaving dead bone which forms the hard antlers. After the mating season, the pedicle and the antler base are separated by a layer of softer tissue, and the antler falls off. During the mating season, bucks use their antlers to fight one another for the opportunity to attract mates in a given herd. The two bucks circle each other, bend back their legs, lower their heads, and charge. Each species has its own characteristic antler structure - for example white-tailed deer antlers include a series of tines sprouting upward from a forward-curving main beam, while Fallow Deer and Moose antlers are palmate, with a broad central portion. Mule deer (and Black-tailed Deer), species within the same genus as the white-tailed deer, instead have bifurcated (or branched) antlers - that is, the main beam splits into two, each of which may split into two more. Young males of many deer, and the adults of some species, such as brocket deer and pudus, have antlers which are single spikes. A rub is used to deposit scent from glands near the eye and forehead and physically mark territory. Deer are threatened with habit loss from urban sprawl and commercial construction, trophy hunting and poaching, disease and government mismanagement. Wildlife management agencies, rather than working to preserve ecosystems, often manage wildlife purely for human recreation. Deer are viewed as a "resource" to be conserved simply for recreational purposes. As a result, "deer management" usually keeps deer populations high, resulting in many human-deer conflicts. Exterminators are hired by neighborhood associations and municipalities to slaughter "nuisance deer". Left unaltered, the delicate balance of ecosystems is maintained by nature with predators reducing the sickest and weakest individuals.